Now You Can Use Your Existing Remote To Control a Fully Loaded Thatcham Approved Car / Van Alarm System . Call 0800 1223156 Or 07894500229 For A Quotation For Your Vehicle. Without The Threat Of An alarm Sounding Thieves Can Do A lot Of Damage In An Attempt To Force Locks. Also As In The Picture On The Above Right Without Locks Fitted At The Centre And Top Of The Doors The Van Can Still Be Emptied Of Valuable Tools. Of Course The Perfect Van Security Would Include An Alarm And Decent Locks, But This Can Be Costly. Here Are Some Advantages Of An Alarm Over Locks, Ultimately The Decision Is Yours, But Either Way Don't Leave It To Late, Act First! Fit Some Additional Security On Your Van Before Its Too Late! An Alarm also covers window breakage, which in the case of for example a Ford Transit owner can be the difference of keeping the vehicle and Its Contents All Together! As Even With Aftermarket High Security Door Locks Fitted A Theif Only Needs To Smash The Drivers Window, Lean In And Plug A Clever Piece Of Hardware Into The OBD Socket, Clone A Key, And Away Your Tools / Equipment And Van Goes In Seconds! If An Alarm Is Fitted The Alarm Triggers If They Smash The Window, And Continues To Sound, As well As Covering Entry Through Windows, Higher End Alarms Can Immobilise The OBD Socket Rendering It Useless! With "Peel Back Craze" Locks Need To Be Installed At The Tops Of The Doors To Be Effective. Unlike Locks, Alarms Can Be Transferred From Van To Van, So Once You've Paid The Initial Outlay On A Good Alarm / Security System, You Can Keep It For As Long As You Like. Alarms Can Reduce Your Insurance Premium.Listed Above Are Just Some Advantages Of Alarms Over Locks, But The Decision Is Yours. All Work Wiring And Connections Guaranteed For as Long As You Own The Vehicle. Auto Security Systems . Since 1988. Designed and Manufactured In South Africa, Where Car Crime Is Amongst The Highest In The World.. Original Factory Car Alarm Systems Used By Ford, VW, Peugeot, Renault And Mitsubishi, In South Africa and Israel! Rest Assured, Autowatch Car Alarms Meet The Very Highest In Vehicle Security And Reliability Standards. FreePhone 0800 1223 156 Note: You May Experience an 8 to 10 Second Initial phone line Connection Delay. The Convenient Way To Professionally Secure Your Vehicle . 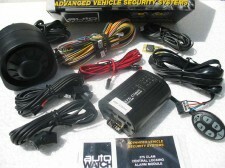 The Autowatch 375 car alarm system incorporates several sensing systems to protect your vehicle. Each time the car alarm system is turned on, these sensing systems start to monitor the vehicle and if an unauthorised interference is detected, the alarm system is triggered. As you lock or unlock your vehicle with the factory remote ''plip'', the alarm will provide both visual and audible confimation that the alarm system is operating. The Alarm light (LED) and/or OPTIONAL four button keypad fitted on the dashboard also indicates the status of the car alarm and provides a visual deterrant . Uses the vehicles exsisting remote controls, If your vehicle has a factory fitted remote locking system, you can convert it into a full alarm system with the Autowatch 375 CLAM. The existing key-fob remote ''plip'' will continue to lock and unlock your car as normal, but will simultaneously control the Autowatch 375 CLAM alarm system to provide additional protection for your vehicle and valuables. Professional Car Alarm installation in Edinburgh Glasgow Dundee Aberdeen Inverness Motherwell Hamilton Cumbernauld Falkirk Dumfries Ayr Kilmarnock Perth and Many more locations throughout Scotland. Car Alarms Glasgow, car alarms edinburgh, car alarms aberdeen, Fully Guaranteed Mobile Car Alarm Installation Service, Car Alarms Fitted At Home Or Place Of Work. car alarm fitted glerothes, fife,car alarms installed glenrothes., Kirkcaldy.